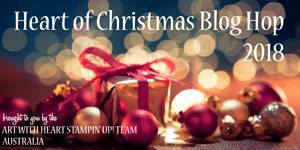 Today is the last Heart Of Christmas Blog Share for 2018. Have you enjoyed seeing all of the Christmas inspiration? Has it inspired you to start on your Christmas cards? I hope so! The card I have made for this week's Blog Share has been one I've had on my mind for the entire 15 weeks of Heart Of Christmas. I just always kept putting off making it, as other ideas and new products took priority. As today's is the last, it was time to put ink to cardstock! I couldn't resist adding a Red Rhinestone to turn him into Rudolph! Here he is again on the inside. I hadn't intended to add the rhinestone to this deer's nose, but it just didn't look quite right without it after doing the one on the front. You can see the rest of this final week's cards over at Claire's blog. I'm sure you'll love what you see. Super cute reindeer card, Tina, you've inspired me to get this set out again too. Oh, I'm so glad you got to stamp this fabulous card. It is so amazing, and the dimension you have achieved with the stamping is fabulous! Thankyou for so consistently participating in Heart of Christmas this year! What a Cutie Tina, It's a real smile on your face card (for Me). Love it. Tina you've certainly saved the best to last....so cute!!! Oh he is a super cute Foxy Deer! Love it! Oh Tina, this is so cute.